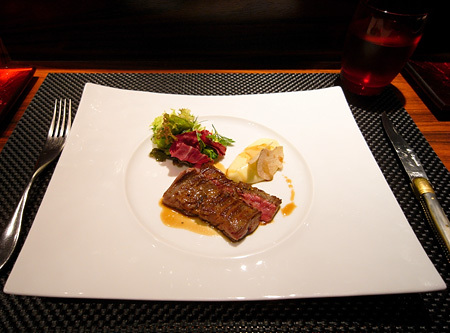 The restaurant is located on the main plaza level of the Mori Tower in Roppongi Hills. While Roppongi Hills is ostensibly a mega-complex incorporating offices, shops, hotels, museums, parks, etc., etc., in reality, when you think of it, you think "mall" (see also: Per Se; but Roppongi Hills is not quite as charmless as the Time Warner Center). In that regard, it's not an ideal location for fine dining. However, to be fair, you also don't think "great museums" when it comes to malls, but the Mori Art Museum there puts on some fantastic shows (there's a Corbu show there until the 24th, catch it if you can). I've read that it's fantastically difficult to score a seat at the New York location, but in Tokyo, I walked in off the street at around 8 and was promptly seated at the bar. The restaurant was at roughly 70-80% capacity. The chef's tasting menu is a relative bargain for Tokyo (and for New York, for that matter) at ¥12600/US$102, plus 10% service charge. 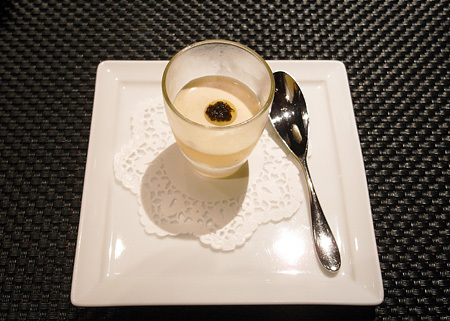 The amuse was one of those French gelatinous-something-or-other in a shot glass which I always have a hard time identifying, but the little bit of shaved star anise on top made the dish. The helpful Japanese staff (is there any other kind?) tried in vain to explain what it was to me, but to no avail. Okay, I may not be able to tell what exactly I just ate, but I can tell you it was delicious. The next course was a few slices of ham. 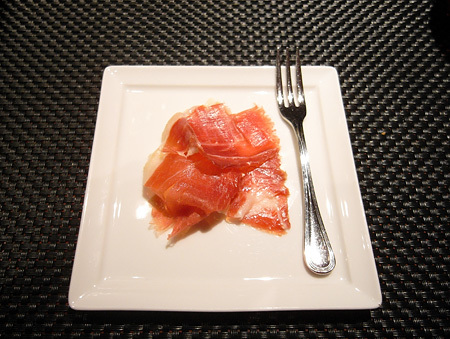 Of course, it's not just any ol' ham, it's ibérico de bellota—the highest grade of jamón ibérico, a Spanish cured ham. (Bellota is Spanish for "acorn", meaning the ham comes from pigs that were fed only acorn pre-slaughter.) Sure, it doesn't involve any cooking or preparation on the restaurant's part, but oh my god, what a choice! what a ham! I've had my share of good Spanish hams, but this was far and away the best I've ever had. 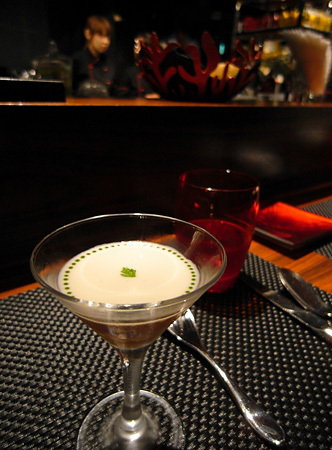 Next up was one of Robuchon's signature dishes, sea urchin in lobster gelée, topped with a cauliflower cream with a ring of parsley mayonnaise dots. It looked like it was put together by robots, because how else can anyone get the dots to be in a perfect circle, each the exact same size and distance from one another? Probably because I had absolutely the best uni the previous night at Kyubey and then again that morning at Tsukiji, I noticed that the uni here didn't quite measure up to those. Otherwise, a great dish. The weakest part of the meal was the scallops. They were great, but aren't they all in these types of places? 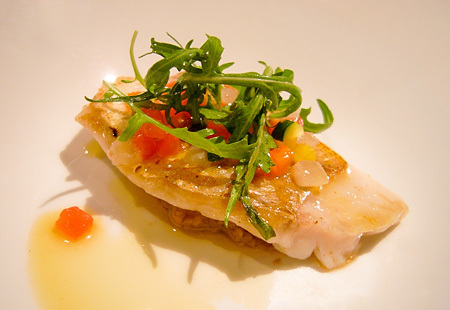 It's a fine dish all around, but nothing particularly stood out about it, good or bad. I did think it probably could have been a touch more rare. This was when the meal went from ordinarily good to extraordinarily good. Scampi ravioli in heavy cream on a bed of buttered bokchoy. It's seriously one of the best dishes I've eaten anywhere. The bokchoy's sweetness provided the perfect contrast to the heavy cream sauce. While I was still sky high savoring the lingering taste of the scampi ravioli, the intoxicating smell of the next dish placed before me snapped me back to attention. I looked down. A fillet of fish? 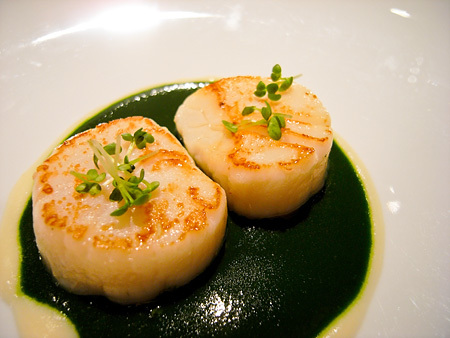 These dishes, like the scallops before, almost always bore me. But that smell! I dug in to the sea bream. Wow. There's some subtle Eastern-inspired flavors in there that I can't put my fingers on (I'm terrible at breaking down dishes to their ingredients, mostly because I tend to swallow my food) which worked superbly with the subtle bitterness of the baby arugula. Following the two stunningly good dishes, the next course by comparison was only excellent. The medium-rare beef was mighty fine, but the apple-truffle mashed potatoes took it to another level. 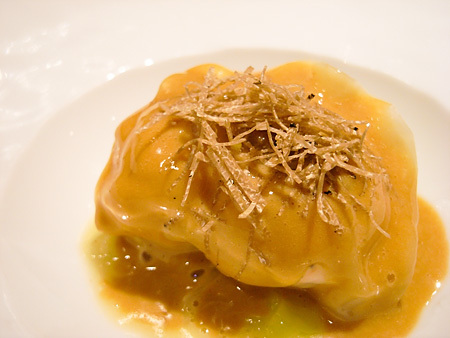 In fact, it may be the first time I thought a truffle-infused anything is that good. Usually, it's so heavy handed to show off that it's used, but not here. You could hardly tell it's there—just that there's something unusually good about the mashed potatoes. The little bit of cilantro in the salad gave it the right snap. It's the little Eastern touches like this that make most of these dishes so amazing. These dishes are unmistakably French (unlike the majority of East-West mashups popular on menus these days), but the hints of Eastern flavors he peppers throughout his dishes bring that extra dimension to his creations. 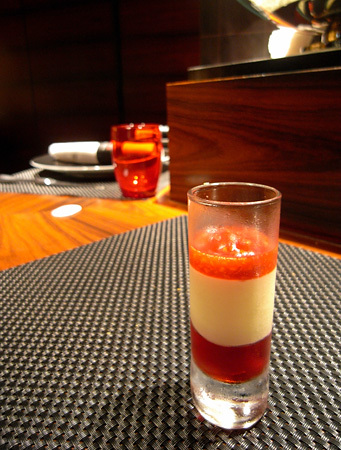 The pre-dessert is a white chocolate mousse sandwiched by raspberries. Absolutely delicious, though I have to say, it may be one too many liquid-y things in a glass for one meal (this was the third such dish of the night). The most radical part of the meal was the main dessert. 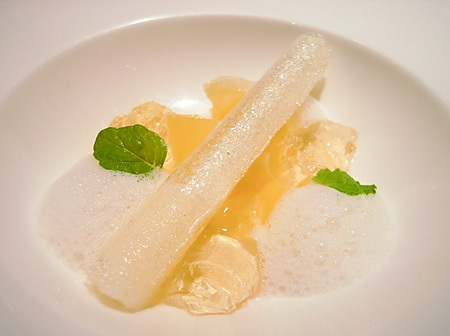 It's a citrus ensemble with grapefruit sorbet encased in a hardened sugar tube, on top of citrus foam and jelly with chunks of grapefuit marinated in honey. The concept and construction titillated and the taste? Perfect blend of sweetness and tartness. 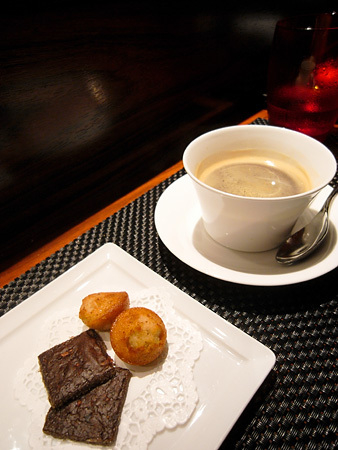 The meal ended with some coffee and petit fours (all very good, of course). All in all, a nearly flawless meal. The uni could have been better, but it might not be fair to compare it with uni from a sushi temple like Kyubey where a meal costs twice as much. And the scallops did not wow (just merely very good, if that can be considered a negative). That's it. And I'm being nit-picky. 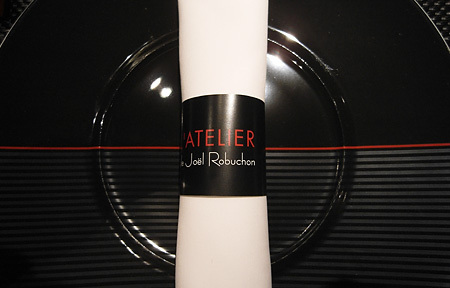 For more pictures, see my "L'Atelier de Joël Robuchon (Tokyo)" set on Flickr. Open daily 11:30am-2:30pm and 6-10pm.